Physical properties of emerald: Beril are opaque, translucent and transparent. Beril with coloring agent green with translucence or transparency is called emerald. Specific gravity of emerald is between 2.65 and 2.8 and its hardness in Moh's scale is measured between seven and half to eight. Refractive index of emerald varries between 1.56 and 1.59. 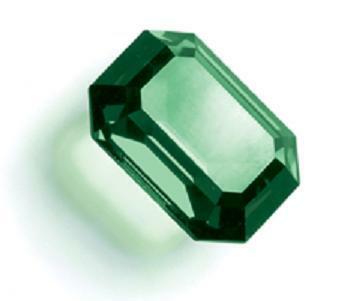 Origins: Columbia, Zambia, Brazil, Madagascar, Russia, Zimbabwe, Pakistan and India are major sources of emerald. However, Columbian emeralds are considered as the best. Zambian and Sandwana (Zimbabwe) mines are also producing very good emeralds. Origin or mine of emerald plays a major role in determining its valuation. It is therefore, advised to know about origin before buying an emerald. Four “C”s of emerald: Like any other gemstone four “C”s play major role in determining value of emerald. These four “C”s are Cut, Clarity, Color and Carat weight. It is better to know about four “C”s before buying an emerald. Cut: There are various types of cuts in emerald gemstone. These are faceted, cabochons, beads, drops, carvings etc. Cut stones are the costliest followed by cabochons and beads. Cut stones are faceted but cabochons are plain. Beads and drops are manufactured both in faceted and plain quality. There are various shapes in both cut and cabochons such as Oval, Octagon, Square, Pear, Heart, Marquise and Round. There is a special cut for emerald. It is basically octagon but called emerald cut. This cut enhances beauty of emerald. Clarity: Clean emerald is rare of the rarest. Gemstone emerald often has many inclusions. Black and yellow spots, cracks, micaceous, hole inside, fissure, dichroism etc are main inclusions of emerald. More inclusions means lesser clarity (purity). Clean is rare and fetches highest price. Emerald with better purity has more price and with lesser purity has lower price. Carat weight: Bigger the size more the price. It is true for good quality emeralds. Fine quality emeralds of bigger sizes are rare. Generally fine quality Zambian or Sandwana emeralds above 10 carats are rare. Sizes between four to seven carats for a fine quality Zambian emerald is considered as very good. Color shades: Color of emerald varies between light to deep green.Sometimes it has blue, yellow or black tints. Light color fetches lesser price than deeper color. However, over color emeralds fetch lower price. Generally bright green is the costliest. Bright green with golden tint is royal color of emerald. Blue, yellow and black tints present in emerald lower the price of an emerald gemstone. Oily green color is not also considered good. Colombian emerald has the most pleasant bright green color. Russian emerald is normally of light color and Zambian emerald has blue tints. Bright color and transparency of Colombian emerald fetches maximum price. Hence, you can stress on Colombian origin while buying an emerald. However, price of emeralds does not depend too much on mines like rubies. Mines other than Columbia also fetch very good price. Fine quality Zambian or Sandwana emeralds are also very expensive. Emeralds Oiling Treatment Emeralds are typically found with natural internal fissures which are known as “gardens”. Long ago it was discovered that the simple application of oils would greatly reduce the visibility of these inclusions, thereby noticeably enhancing the emerald is appearance. This practice has become traditional and is accepted throughout the precious gem trade. Emeralds are also known to be not quite as durable as diamond, ruby and sapphire. This fact combined with the common practice of oiling requires the owner to take a little extra care of their wonderful green gems. It is also common to oil emeralds to enhance their appearance, usually done as a post-lapidary process in the country of origin. This is acceptable in the gem industry as long as no coloring agents are used. What is the reason for this error message?Please correct it immediately so that one can buy online.